Forget the Loch Ness Monster or the mystery of the Himalayan yeti, the legend of the big cat of St Albans may have finally come closer to resolution. A stunned cabbie believes that he caught the legendary big cat on camera minutes before sunrise on Sunday. Jahid Choudhury dramatically snapped the huge beast – which looks like a deadly puma – as he drove home at 4.30am in the morning after finishing work. The quick-thinking London Colney taxi driver also captured the beautiful sleek animal, a natural born killer, on video. If that is a 'huge beast – which looks like a deadly puma' I have one sitting beside me demanding a feed of 'Whiskas'. Looks more like next door's Ginger Tom. 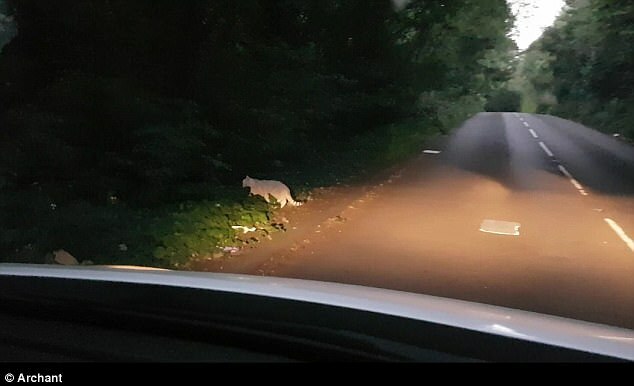 Re: Is this the mystery big cat of St Albans? It's just a ginger tom! That definately looks like a puma, bit on the small side. I thought it may have been my cat if it was thought to be a panther, he went missing for a week, came back with tenants, ear mites, fleas and a tick, who were immediately evicted. @Flix wrote: That definately looks like a puma, bit on the small side. I thought it may have been my cat if it was thought to be a panther, he went missing for a week, came back with tenants, ear mites, fleas and a tick, who were immediately evicted. Mine is too lazy to go to the trouble of nicking knickers. Read that in our local paper last week, no one has claimed the items as yet.